Below is the information for Saturday, 29th November 2009. There will be plenty to see, do and buy at this years’ Beaumaris Victorian Festival. The day is due to begin at 2pm with plenty of charity and craft stalls around the town – come and stock up on your stocking fillers and Christmas cards. With a wealth of gift shops and galleries its the perfect opportunity to look for a gift which is a little bit different – and don’t forget those extra special Christmas decorations. Entertainment will be provided throughout the town – including Punch and Judy and a Barrel Organ – with plenty of stalls offering snacks and mulled wine to keep you warm. There will be plenty of opportunities to win prizes with the Grand Raffles offering a top prize of £100 and an extra special ‘mystery prize’ donated by the Town Mayor. There are children’s and adult’s prizes available for the best fancy dress – either on a Victorian or Christmas theme – and a further £50 prize for the best lantern. The Canolfan are offering prizes at their stall – based on a Victorian sporting theme - in the Market Square and there will be plenty of charity raffles and tombolas to take part in. To enter the Fancy Dress and Lantern competitions just join up with the parade, starting at the Liverpool Arms at 6pm, and making its way to White Lion Square for the judging and prize giving. Why not join in the fun and help us to brighten up the parade? Entertainment will go on into the evening with various events planned – including a ghost hunt – look out for leaflets for more information. 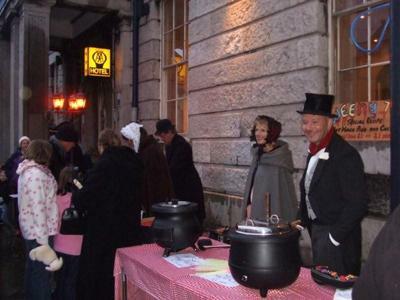 The Victorian Christmas Festival in Beaumaris will be held on Saturday, 27 November 2010. Do not worry peoples we will have it sorted by the 28th. I think ????? some people don't read the article properly. It says clearly "2009" in the title! yes, I think this must be for 2009.
i think this refers to 2009! the organisers need to send their curent event list to the site i guess. What saturday is the Victorian week end? The victorian day is advertised to take place on saturday the 29th November. That must be wrong. The last saturday in November 2010 is the 27th, is this the correct date? Date is posted as SATURDAY 29th NOIVENBER 2009. The date for SATURDAY that weekend is 28th ? ?